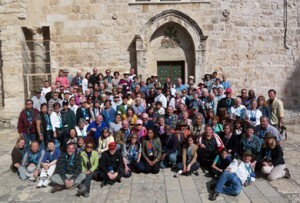 Here is a group picture of all our pilgrims at the Church of the Holy Sepulchre in Jerusalem. UPDATE: Saturday, March 14. Pilgrims from the St. Paul cruise are now home! It is always frustrating to be cut off from the world with no internet! They are off the ship and after shopping and having lunch they will visit the Egypt Museum and head to the hotel for the night. Everyone is doing well and at this moment are at the pyramids in Egypt. Everyone is fine and things are going famously! More soon.